← "Mommy, I love our new home"
Shoes, Koolaid & Toothbrush Drive! 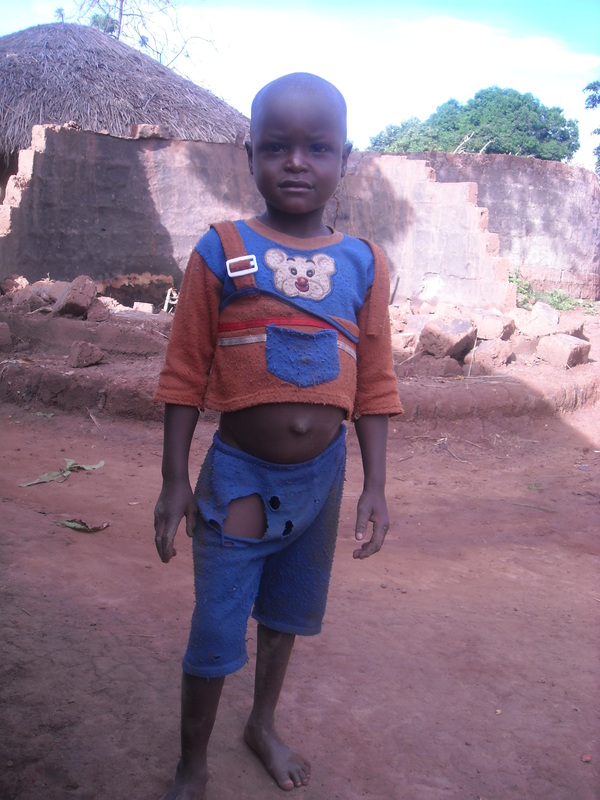 We have the rare opportunity to shop for children in Uganda! In October, several people will be traveling from Phoenix to Uganda. Requested items include black school shoes, Kool-aid and toothbrushes. Would you like to help? 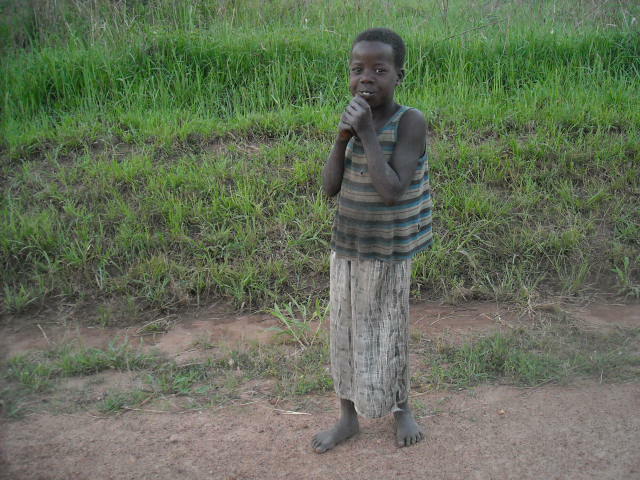 Like Betty and the little boy above, many of the children in Kochgoma, Gulu, Uganda do not own a pair of shoes. And if a child can have only one pair of shoes, black school shoes are what they request. 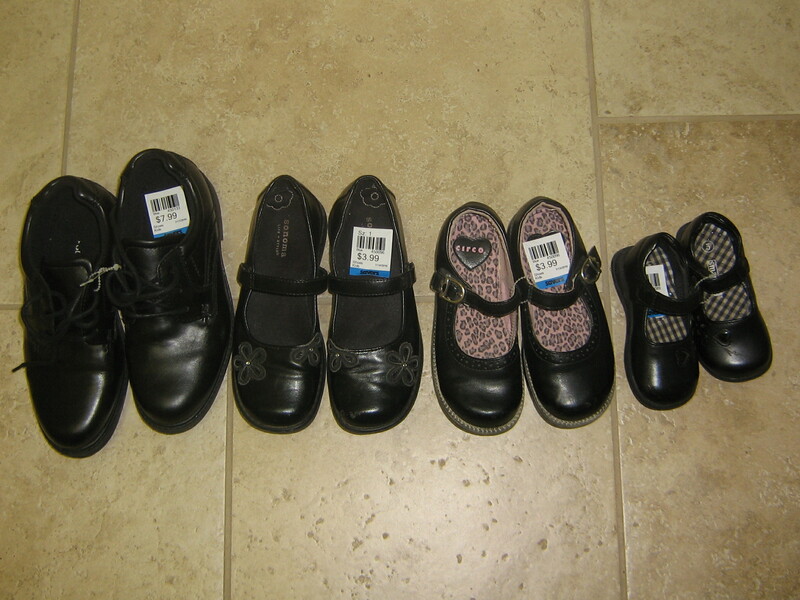 Black dress shoes (boys or girls, ages 4 and up). We recommend secondhand shoes in good condition over new shoes from Walmart or Payless. Savers, Goodwill and Salvation Army have shoes between $3 and $8 a pair. (Savers has 99 cent shoes on Mondays. Donate one item and receive a $3 coupon off of a $10 purchase). Drop point is at Frank’s office (RE/MAX Professionals) at 7111 W Bell Road between 8:30 and 5:30 M-F or 9-4 on Sat. Please e-mail us with any questions. We anticipate being able to take between 85 and 90 pairs of shoes. Cara has bought shoes for several of the children in Nkumba. Below is one of her recent blog posts that gives a glimpse into the life of the shoeless. I’m confident that most people, like me, are victims to the Target syndrome, the syndrome where you walk into Target with a list of 3 things and walk out having spent $150 or worse. Of course all the things you buy are somehow justified and at the time you were pretty sure you ‘needed’ them. It turns out I have found my Target here in Uganda. It looks a bit different and is really more of a collision of a Target and Goodwill, but nonetheless Target Syndrome kicks in. Markets are very common in Uganda and each Friday our village has their market. It is a place where you can find food, light bulbs, extension cords, shoe polish, soap, hair extensions (something I am not tempted to buy), radios, fabric, new shoes, secondhand shoes, new clothes, secondhand clothes, bags, bread, mangos, on and on and on. I love market days and look forward to them each Friday. 21 pieces of clothing for kids (secondhand) – that is always the kicker, I can’t help myself. I love love love buying kids clothes. The reason I bring this up is because as I was spending money like it grew on trees, I thought it may be interesting to share with you the cost of things here in Uganda and provide a bit of insight to how things are not that cheap here, especially when given the monthly income of most people. 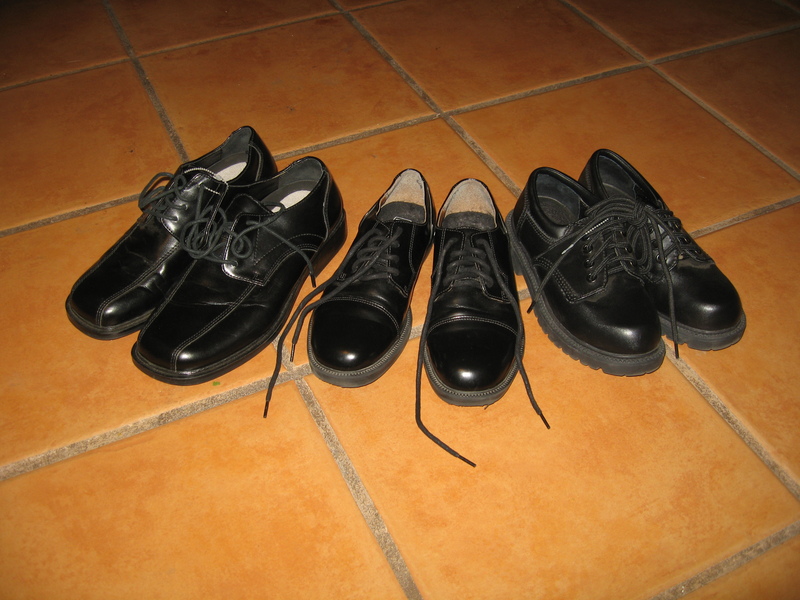 I bought 2 pairs of secondhand shoes for students at the school, one pair for $7.50 and the other pair for $12.50. Shoes for $7.50 isn’t so bad until you figure the same pair of shoes would cost around $3 at Goodwill in America. I bought 2 kilos of sugar for $1.25 each. The bread was $1.20, the clothing for around $.50 each piece and bananas for $.50. By American standards these prices are really good but consider that the average household here makes probably between $30-$100/month and it changes everything. Most people probably pay between $10-$40/month for rent for their one or two room apartment. If you are making $50/month, one pair of shoes for $7.50 is really expensive and children’s clothing at $.50 a piece is by no means a bargain. Please also take into consideration how quickly children grow. Given the high cost of school fees and cost of the uniform, it is not surprising then that children may go without shoes to school or only have 2 or 3 outfits. You can see how foods like bread, butter and sugar quickly become luxury items. Other locally grown foods are also extremely expensive given the income levels of the people. I’ll be the first to admit that I often times look at children without shoes or socks for school or clean clothes and wonder why their parents can’t provide these things for them. But when I take a minute to think about Abdul’s mom who works 6 days a week, over 10 hour days and makes less than $50/month, I understand why Abdul didn’t have shoes for school. It makes me terribly sad to think of a little 5-year-old boy walking over a mile to school everyday in bare feet (one pair of shoes was for him). I truly cannot imagine how difficult it must be for parents in these situations. I have never experienced anything close to this in my life. I try to be careful with how much money I spend and go without things I don’t need (although ‘need’ is a very relative word) but I have never been in the position where bread, soap, butter or sugar were luxury items. Can you imagine bringing soap, toothpaste, salt and sugar as Christmas gifts for somebody? These are the very items we gave to people in our community for Christmas and they were so incredibly grateful for the help. It is truly unbelievable. What’s also incredible is that if you were to visit any of the people in my community, they would gladly share with you their food, tea, sugar and anything else they had. You would be welcome in their homes, regardless of what they had, and you would experience true joy. Abdul is a joyful child who is always smiling and he is one of the many blessings in my life. I believe that these people choose to be joyful and they choose to be grateful. I would guess that many of them have discovered something many Americans have missed – God is truly all we need and He absolutely provides for us all. Sugar or no sugar, bread or no bread, shoes or no shoes, God is it and He means more than salt, mangos, clean clothes and school shoes. I suppose I should get off my soapbox now but I hope this provides a bit of insight into the lives of the people here. I pray that as you put sugar in your coffee, have toast and butter for breakfast and use soap to wash your clothes, you are reminded of the dear and wonderful people of Uganda.